What Problems Can Persona Plan Help You Solve? Did you know that only 26% of businesses write a marketing plan, and 58% of those that did not cited ‘lack of expertise’ as the main reason (according to Advertising Age). We created Persona Plan to solve this, and related problems. competitors encroach on your territory. even when you spend millions. but don’t have the time. your business, but not growing it. no results from your marketing. but don’t have the expertise. need to work on your marketing plan. You don’t have a clear position or image for your company. There are many ways to approach these problems – consultants, self-help books, experts, hard work, sweat capital, luck – but if you want to remove risk factors and reduce costs, you need a formulated, proven solution. 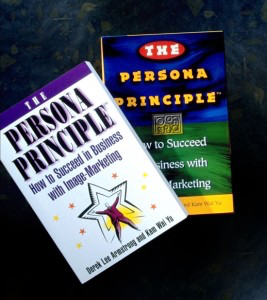 In 1996 Simon & Schuster published a book by our directors, titled The Persona Principle, which defined Image-Marketing. Image-Marketing takes brand to its ultimate level, defining the persona of the brand as the underlying truth and strength of any product or service. The entire personality. We defined 88 contributing factors, and advocated a method of inventorying all of these factors on a measured scale. Then, to do the same with your competitors. The comparison of your 88 factors to those of your top competitors is the underlying strength of a formal Persona Plan. With that deeper understanding of personality, core truths become evident, assets become exploitable power tactics, and liabilities become fixable. Ultimately, Persona Planning is one of the most practical and simple ways of understanding and developing a product or service or corporate brand Persona—in a meaningful way that resonates with your target audiences. Why guess how to succeed? Persona Plan helps you know. Ask for a proposal for your brand’s Persona Plan.